Developed at a time when faster swept wing jet aircraft were becoming prominent, the piston engine straight winged AD Skyraider (redesignated A-1 in 1962) filled a vital niche for the United States Navy, Marines and Air Force. Ed Heinemann of Douglas Aircraft Co. designed the Skyraider in response to a US Navy requirement for a single place carrier based long range dive-bomber / torpedo attack aircraft. 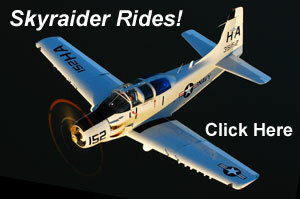 The prototype Skyraider first flew on March 18, 1945. The first production AD-1, delivered in December 1946, went into service in Navy Fighter Squadron Nineteen (VA-19A). The plane played an important role in the Korean War. 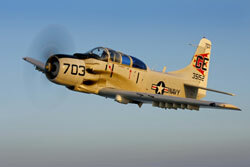 Flown by Navy and Marine squadrons, the Skyraider was the backbone of close air support and ground attack operations. Its powerful Wright R-3350 radial engine and ample fuel load gave it a large combat radius, especially compared to jets of the period while its large straight wing and seven hardpoints per wing, gave it excellent low speed maneuverability plus the ability to carry a large amount of ordnance. Years later, in the Vietnam War, the Skyraider again proved its usefulness flying ground attack support missions for the Navy and Air Force, and a new mission: Search and Rescue. Affectionately known as " Sandys," Skyraiders would fly to the location of a downed pilot and stay on site, laying down smoke, napalm, rockets and 20 mm fire to cover the rescue. Though the plane was never designed for air to air combat, Navy Skyraider pilots shot down two MiG-17 jet fighters, a further testament to its abilities. Douglas manufactured a total of 3,180 Skyraiders in seven variations. The AD-5 was a multiple crew variant with significant modifications. The fuselage was lengthened and widened to accommodate side by side seating for pilot and co-pilot as well as a crew / equipment compartment aft of the pilots. The engine was moved 8 inches forward and the vertical tail area was increased almost 50%. The AD-5 was produced in the following models: AD-5 (A-1E) Side-by-side seating for pilot and co-pilot, without dive brakes; 212 built. AD-5N (A-1G) Four-seat night attack version, with radar countermeasures; 239 built. AD-5Q (EA-1F) Four-seat electronics countermeasures version; 54 conversions. AD-5W (EA-1E) Three-seat Airborne Early Warning with APS-20 radar installed; 218 were built. UA-1E Utility version of the AD-5; conversions. The AD-5W on display, Bureau No. 135152 was delivered to the United States Navy in 1955. It served with Carrier Airborne Early Warning Squadron Twelve (VAW 12) from November 1956 through December 1960. The next assignment was with VAW 11 from May 1961 through November 1962. It was retired from Navy Service in 1963. In 2008, the Cavanaugh Flight Museum added 135152 to its collection and to its Living History Flight Experience Program. The plane is painted in the colors and markings it wore when in service with VAW 12 (Nickname “Bats”) during the late 1950s. ENGINE Wright R-3350-26W developing 3,020 h.p.